There are no standard puzzles except for the small puzzles, so there are also no standard prices. When you contact us you initiate a discussion. Once we understand what you want, we write a job description for your approval and give you a quote. If the description is correct and you accept the quote, we ask for a deposit. The final payment is made when the puzzle is finished. The size of the puzzle, the number of pieces, the style of cutting and the incorporation of whimsies/silhouette pieces, sculpting or other special requirements all influence price. Shown at the top of this page are two pieces cut in different styles. The one to the left has a complex shape (expensive), the traditionally shaped one on the right is strip cut, a quicker and less expensive technique. Guest books usually cost between $100 and $600. 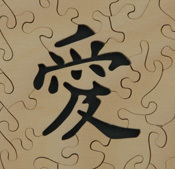 The average cost of a puzzle with sculpted lettering and traditionally shaped pieces is about $300. The smallest puzzles come in CD cases. For all other puzzles the price guidance above does not cover packaging except for that needed to protect the puzzle on its journey to the buyer. For medium sized puzzles we offer two types of boxes. On the left is a box for storing dismantled puzzles. It costs $20. On the right is a tray type box with a clear sliding lid. These come in two sizes: 21 x 29.7 cm (A4) or 19.7 x 42 cm (A3), costing $25 and $35 respectively. Puzzles of appropriate size can be stored assembled in the tray type boxes. If you add some hooks, the puzzle can be displayed on a wall. Visiting: You can visit us by appointment at the address above, which is in Melbourne. We do not have ready made puzzles for sale. 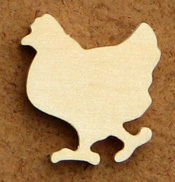 Whimsies/silhouette pieces are individual puzzle pieces with a recognisable shape. Sculpting refers to the creation of a shape or text by removing slivers of wood from the puzzle. This Chinese character means love.